A confluence of seemingly unrelated technologies developed outside the aerospace industry has opened up exciting new prospects for aviation in the 21st Century. 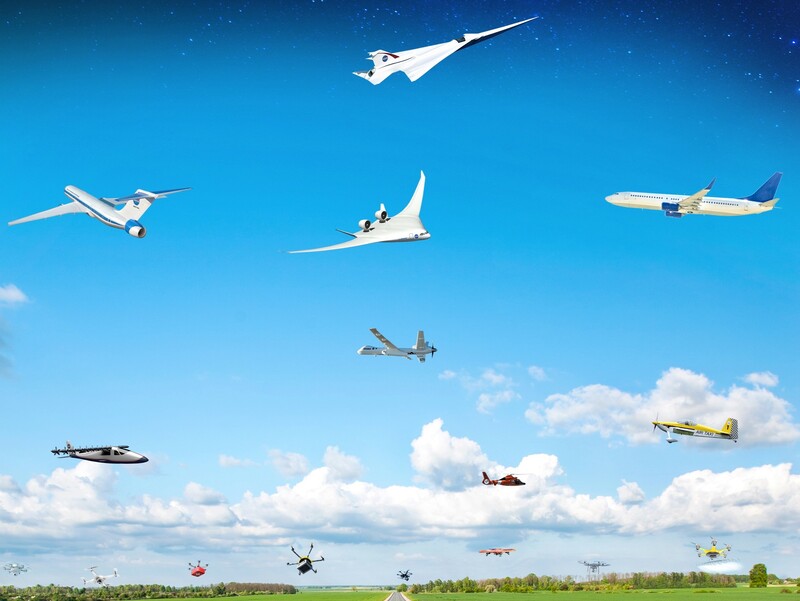 NASA is focusing on six strategic areas to develop these technologies to meet the needs of 21st Century aviation. There areas span a wide range of efforts to develop subsonic aircraft that utilize unconventional structures, electrically propelled aircraft, vertical lift aircraft, low boom supersonic aircraft, hypersonic aircraft, unmanned and autonomous aircraft (“UAS”, “drones”) and UAS traffic management solutions. For instance, the confluence of newly developed technologies in GPS, electric power systems, autonomous systems, and communications is propelling a seemingly unlimited number of applications of small unmanned aerial vehicles in low altitude airspaces that is regulated but remains largely uncontrolled. NASA is involved in research on UAS and in developing ways to manage UAS to ensure that their benefits are realized while keeping airspaces safe for all. The combination of rapid advances in composite materials, digital controls, electric generation, propulsion and storage systems, is leading to far more fuel-efficient, less polluting, and more comfortable aircraft that are likely to look very different from today’s large transport category airplanes. NASA is working on novel and often unconventional aircraft design that leverage these developments for safer and greener subsonic aircraft propelled by conventional engines and entirely new aircraft driven in part or entirely by electric motors NASA’s new X-plane initiatives are a crucial aspect of its efforts to develop and implement these new technologies in ways that will facilitate the creation of new types of airplanes to meet future worldwide demand for environmentally sound, inherently safe, efficient, economical and comfortable aircraft. This lecture will discuss these initiatives and the newly invigorated X-plane program. Jaiwon Shin is the Associate Administrator for the Aeronautics Research Mission Directorate. He guides strategy and manages NASA’s broad aeronautics portfolio, ranging from fundamental aeronautics, to safety, to the nation’s airspace system as a whole. He co-chairs the National Science & Technology Council’s Aeronautics Science & Technology Subcommittee, and he has been deeply involved in setting national policy for aeronautics research and development. He was instrumentally involved in developing Executive Order 13419 setting out priorities for national aeronautics R&D programs through 2020, and the Research, Development, Test and Evaluation Infrastructure policy directive currently being formulated. Before becoming Associate Administrator for Aeronautics he served as Deputy Associate Administrator. He had served NASA before that as: Deputy Administrator for Aeronautics; chief of the Aeronautics Projects Office at NASA’s Glenn Research Center; Glenn’s Deputy Director of Aeronautics; Chief of NASA;s Aviation Safety Program and Deputy Program Manager for NASA’s Aviation Safety Program and Airspace Systems Program. He is an author on a variety of technical papers and has been awarded a variety of awards and honors including, the Presidential Rank Award for Meritorious Senior Executives, NASA’s Outstanding Leadership Medal, NASA’s Exceptional Service Medal, a NASA Group Achievement Award, a Lewis Superior Accomplishment Award, three Lewis Group Achievement Awards, and an Air Force Team Award. Jaiwon earned a BS at Yonsei University in Korea, an MS in Mechanical Engineering at California State University-Long Beach and a PhD in Mechanical Engineering at Virginia Polytechnic Institute and State University. He also is a graduate of the Senior Executive Fellowship Program at Harvard’s Kennedy School of Government. President Larry Millstein called the 2369th meeting of the Society to order at 8:36 p.m. He announced the order of business and welcomed new members. The minutes of the previous meeting were read and approved. President Millstein presented a summary of the 31st meeting of the Society, held in 1872. President Millstein then introduced the speaker for the evening, Jaiwon Shin, the Associate Administrator in the Aeronautics Research Mission Directorate at NASA. His lecture was titled “Exciting Possibilities for 21st Century Aviation: NASA's X-Plane Program”. Dr. Shin began by reminding the audience that the precursor organization to NASA’s Aeronautics mission was founded in 1915, a few years after the Wright Brothers’ first flight, thus predating NASA’s better known Space mission by decades. Dr. Shin explained that NASA Aeronautics research is responsible for many of the advances that helped bring civil and military aviation from the Wright Flyer into the modern era. Dr. Shin then showed a recording of the current daily commercial air traffic plotted through the US airspace, comprising up to 5,000 planes at once. He explained that every flight needs to be managed within defined airways with strict separation and precise landing and takeoff times. Modern aviation safety and air traffic control procedures have made flying so safe that an individual taking a three hour commercial flight every day would expect to fly for 9,000 years without experiencing a fatal accident, making it the safest mode of transportation in the world. Another area that NASA is collaborating with the private sector to research is ultra-efficient, environmentally responsible aircraft. Technologies such as composite wings and fuselages, saw-tooth exhaust nozzles, and non-circular fuselages provide substantial weight savings, as well as improving fuel efficiency and reducing noise. Dr. Shin explained that the near-term development and adoption of these technologies could decrease the fuel consumption of the U.S. commercial fleet by billions of gallons of fuel by 2050. Dr. Shin next discussed what he called the “dawn of a new era” of aviation using composite materials to move beyond the performance limits of the current “tube and wing” airframe design. Future designs being investigated include very long truss-braced wings with non-circular fuselages and “flying wing” designs, all to maximize the effective lift area and engine size while mitigating engine noise. Unusual engine configurations, such as placing them at the top rear of the aircraft, may further increase efficiency by consuming the “boundary layer” air that is closest to the fuselage and thus creates much of the aircraft drag, if engines can be made to operate using the disrupted air. Dr. Shin noted that the increasing demands for high efficiency, low emissions, and reduced noise mean that aircraft designers will soon need to find ways to incorporate electric-based propulsion into their planes. Although the weight of lithium-ion batteries is currently prohibitive, early hybrid designs may be ready for flight test as soon as 2018. Dr. Shin then discussed the polarizing subject of supersonic flight. The 20th century landmark for commercial supersonic flight, the Concorde, was incredibly loud, dirty, and expensive. If supersonic flight is to be resumed, these problems must be addressed. Indeed, due to the disruption and potential damage from sonic booms, commercial supersonic flight over land is currently banned in all countries. NASA has modeled variations on wing designs to create “low-boom” aircraft, and is targeting 2020 for the first flight tests. Dr. Shin also addressed the parallel development of Unmanned Aerial Systems, or drones and the race for safe integration of UAS into the national airspace. UAS policy issues include not only safe operation, noise, and wireless spectrum, but also privacy and security concerns, and simple social acceptance. Dr. Shin noted that the stakes in this race are enormous, because whichever country achieves such integration will reap enormous economic benefits through the availability of new services and efficiency improvements, as well as the sale of UAS hardware as the rest of the world follows suit. Dr. Shin concluded by repeating that the sky is the limit as myriad new aircraft design and propulsion technologies are poised to usher in a new era of flight and new opportunities for US leadership. Several questioners asked for more information about hypersonic flight. Dr. Shin explained that Mach 5, or five times faster than the speed of sound, is traditionally considered the threshold to hypersonic speed. The current airspeed record for jet-propelled aircraft is held by NASA’s unmanned X-43, which achieved Mach 9.7, or approximately 7,400 miles per hour…for ten seconds. One major application of hypersonic engineering would be building spacecraft that can take off and land horizontally, like airplanes, creating tremendous efficiency gains and lowering the cost to orbit. After the question and answer period, President Millstein thanked the speaker, made the usual housekeeping announcements, and invited guests to join the Society. At 10:37 p.m., President Millstein adjourned the 2369th meeting of the Society to the social hour.